Red snapper senbei, shrimp senbei, hineriage, daimaru, and so on, all the typical snack crackers enjoyed by Japanese, and all in the same bag. 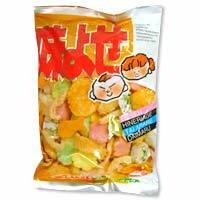 Eat this one bag of snacks, and you will have experienced Japan. These crackers are especially good as munchies with beer or sake. Enjoy!